This antibody may cross-react with ALDH1A2 (GeneID 8854) with one residue difference from this design and with ALDH2 (GeneID 217) with two residues difference from this design. Please note that ALDH1A2 is known to be alternatively spliced under some conditions (37kDa) (2). Synthetic peptide: EVKTVTVKISQKNS, corresponding to C terminal amino acids 488-501 of Human Aldehyde Dehydrogenase 1. A protease inhibitor that inhibits fibrin clot formation. Our Abpromise guarantee covers the use of ab9883 in the following tested applications. WB Use a concentration of 0.3 - 1 µg/ml. Predicted molecular weight: 55 kDa.Can be blocked with Human ALDH1A1 peptide (ab23169). Anti-ALDH1A1 antibody (ab9883) at 0.03 µg/ml + Human Liver lysate (RIPA buffer, 35µg total protein per lane). IHC image of ab9883 staining in Human liver carcinoma formalin fixed paraffin embedded tissue section, performed on a Leica BondTM system using the standard protocol B. The section was pre-treated using heat mediated antigen retrieval with sodium citrate buffer (pH6, epitope retrieval solution 1) for 20 mins. The section was then incubated with ab9883, 5µg/ml, for 15 mins at room temperature and detected using an HRP conjugated compact polymer system. DAB was used as the chromogen. The section was then counterstained with haematoxylin and mounted with DPX. Publishing research using ab9883? Please let us know so that we can cite the reference in this datasheet. We’ll take the goat polyclonal ab115252. Can you send us the protocol that you recommend for this antibody? I am sorry this product did not perform as stated on the datasheet and for the inconvenience this has caused. As requested, I have issued a free of charge replacement for one vial of ab115252. This product is currently out of stock and delivery is expected around November 9. To check the status of the order please contact our Customer Service team and reference this number. Please note that this free of charge replacement vial is also covered by our Abpromise guarantee. Should you still be experiencing difficulties, or if you have any further questions, please do not hesitate to let us know. I wish you the best of luck with your research. Thank you for your reply. As we have already sent a vial of ab9883 as a replacement and neither ab9883 vial has produced acceptable results, we generally would send a different antibody to try. We also have a mouse monoclonal ab105920, and a different goat polyclonal ab115252 that have been tested in human IHC-P: https://www.abcam.com/ALDH1A1-antibody-5A11-ab105920.html https://www.abcam.com/ALDH1A1-antibody-ab115252.html Please let me know if one of these is acceptable and I will send it to you promptly. Thank you for your reply. I think we have found the original order from February, but as we have sent a replacement vial of ab9883 which also did not work, in this case it might be best to issue a credit note or refund since the rabbit polyclonal ab23375 can not be used. Please let me know if this is an acceptable solution and I will issue the credit/refund immediately. Let me know if you have any questions or if there is anything else we can do for you. Can you send us the same one that we were trying to use (ab9883)? Thank you for your reply. Could you please provide your original order or PO number? I did find an order that went to your institution, however we had already sent a replacement vial of ab9883 on that order. If you have not been able to obtain satisfactory results with two vials of ab9883, an alternative antibody may work better in your application. As Caitlin had mentioned, ab23375 is highly rated and would also be guaranteed for your experiment. Alternatively, I would be happy to offer you a credit or refund. Please let me know your original order or PO number and how you would like to proceed and I am happy to assist you further. Thanks for your reply. 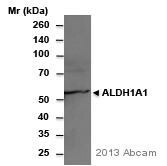 We have a few other ALDH1A1 antibodies but this is our most popular and has very good reviews/publications. It is a rabbit polyclonal, it does work in paraffin sections, and it has been tested for cross-reactivity with human, mouse, rat, dog, goat, and sheep samples. Please let me know if you have any other questions. It’s still not working for us. We tried it with dilutions of 1:50, 1:75, and 1:00. Can you send us a new antibody? Thanks for keeping me updated. I would be happy to send a replacement antibody. Do you want another vial of ab9883 or would you prefer to try a different ALDH1A1 antibody? We also have ab23375 which has been used in 5 references and has a 4-star rating from other users- https://www.abcam.com/ALDH1A1-antibody-Neuronal-Marker-ab23375.html Please let me know which you would prefer. I look forward to hearing from you. Thanks for your reply and for sending the answers to these questions. Your protocol seems very solid and the only thing I would recommend trying is to use a higher concentration of the primary antibody. Ab9883 is provided half as concentrated as most of our other antibodies (0.5 mg/mL versus 1 mg/mL) and we do recommend a 1:75 dilution as stated previously. If there is still no staining after using this dilution, I can send a different antibody to try or alternatively issue a credit or refund. I look forward to hearing from you. Please keep me updated, and let me know if you have any questions. Thank you for contacting us and letting us know about the trouble with ab9883. I have looked through the protocol that you sent but I do have a few additional questions so that I can better understand the situation: 1) What was the Abcam order number or lot number of ab9883 that was used? 2) What kind of samples are being stained (e.g. what species and tissue type)? 3) What is the nature of the problem? Is there no staining, high background, or incorrect localization? 4) Was a 1:1000 dilution of the primary antibody used? We would recommend diluting the antibody 1:75 for use in IHC on paraffin-embedded tissue. 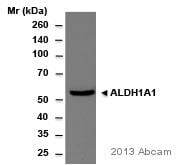 5) Is the rabbit antibody also a ALDH1A1 antibody? 6) Has the detection kit worked well with other goat primaries? We do guarantee all of our products to work as stated on the datasheet for up to 6 months after purchase, so we would be happy to send a replacement or issue a credit or refund if the antibody is not working as expected. I look forward to hearing from you. Please let me know if you have any questions or if there is anything else that we can do for you.